Last year, Monnaie de Paris introduced a new coin series honoring France’s great wealth of pictorial art. 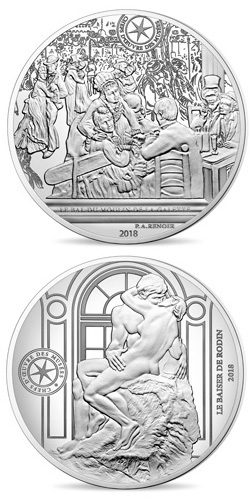 The series continues this year and pays homage to Renoir’s “Le bal du Moulin de la Galette” [The ball of the Moulin de la Galette] that hangs in Musée d’Orsay and Rodin’s sculpture “Le Baiser” [The Kiss] that can be found in Musée Rodin. As was the case last year, each work has been rendered on the reverse of a 37mm, 22.2 g .900 fine silver 10 euro and a 22 mm, 7.78 g .999 fine gold 50 euro. Mintages are 2,000 and 500, respectively. The coin’s reverse reproduces each work in exquisite detail. “Le bal du Moulin de la Galette” in Montmartre depicts working-class Parisians in the late 19th century, dressed up to the nines for an afternoon and evening of dancing, drinking, eating, and general carousing. “Le Baiser” was originally titled “Francesca da Rimini,” referring to a 13th century Italian noblewoman immortalized in Dante’s Inferno. She fell in love with her husband’s younger brother – her companion in the sculpture – and it was all downhill from there. The work once formed part of Rodin’s monumental bronze “The Gates of Hell” but was removed and replaced with another loving couple. Readers who would like either coin should check out the online shop of Monnaie de Paris at: www.monnaiedeparis.fr.